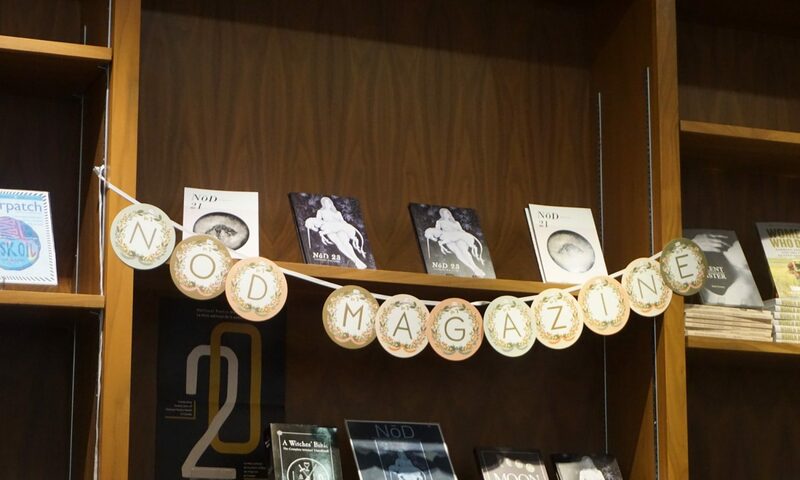 NōD Magazine – Page 5 – is the University of Calgary's sole creative writing publication. We publish poetry, prose, and visual artwork. Anyone is welcome to submit. Good morning! We’re taking today as part of the long weekend and we hope you are too. But if you are working or schooling or doing other responsible adulting today then you should take a break (or start your day) with our latest Issue 21 teaser! And if you are extending your break, then you have all the time of the day to read these poems! scarecrow hangs his head and groans. Hello! We hope your long weekend is going well– we’re only half way through! This teaser is from Emily Calder, a U of C student whose work appeared in our Issue 20 and is also upcoming in Issue 21! This piece accompanies her prose piece that will be unveiled in our next issue, so you should come to our launch party on April 27 at Shelf Life books if you want to read more! Clyde the house spider, always an aficionado of human language, listened curiously to Lil’s phone conversation. He sat on the rim of the corner tub, in the ensuite off the master bedroom. He could see Lil, in her bathrobe and socks, pacing the bedroom floor. His English spotty, Clyde worked out that Lil had gone out on a date the previous evening, and it had not gone well. The spider knew from previous reconnaissance that the woman was a widow. “I suffer from crippling self-awareness,” came the only line that Clyde could comprehend completely, from beginning to end. If Clyde could write he would have written it down. A lovely, self-contained thought. His first full sentence in a second language. Clyde often wished that spiders had history. If he could write books, he would have something to pass on to his offspring. But of course, who knew which of those passersby in the garden or the boiler room really were his offspring? An aspect of arachnid existence that gave all spiders a great sense of community, an understanding of working for something greater than themselves. Lil’s eyes landed on Clyde and she started, stopping his reverie. Clyde braced himself. He scuttled away, but in an unfortunate direction. Lil’s disgusted face, and then nothing but the immensity of a bunched up wad of toilet paper, were the last things Clyde saw before he died. Hello and happy Easter! (You should be done your day for today, so we can start Easter now instead of tomorrow morning). As an official kick-off to your long weekend (because you’re snowed in and can’t get to that party you planned on) have a poem by Faith Barrett. Faith is one of the University of Calgary’s own grad students, but she was originally from Toronto and holds a Bachelor’s degree from the University of Waterloo. Hello, and happy Monday! It’s the last week of the semester so we won’t bother you with a long intro to this teaser (except to say that you should check it out!). Frank Rubino is a performing poet from New Jersey, where he lives with his wife and four children. He’s been active since 1982, with readings at numerous locations around New York. His work has appeared in Vending Machine, DMQ Review, The Cape Rock, Caliban Online, Caveat Lector, The World, Little Light, and New Directions. soft power-gum in hotel-world’s puke carpets. when it’s the big shootout. Good Evening! (Good Morning?) This teaser goes out to everyone who’s drowning their sorrows about finals (essays and exams) in too many vices and have yet to go to sleep, those of you who are ignoring said essays and finals, and to everyone else out there (awake or asleep). You do you, and we’ll keep doing this! This teaser is a visual by Neshan Tung, who has two other pieces that will be featured in Issue 21! Hello, sorry about being a little late with this teaser. You know those days when your homework is glaring at you and you really should just get it done, but instead you decide to go for a hike in the mountains (far, far away from your computer), and when you get back home you decide to have a bottle of wine to further avoid your homework? Well, that may or may not have happened, and that may or may not be why yesterday’s post didn’t happen until now. But it’s not all bad– now you get a post today, and another one tomorrow! Today’s teaser is by Katherine Holm, a poet and emerging theater artist in Calgary. She is a drama graduate student at the university of Calgary’s School of Creative and Performing Arts, with a specialization in Theater Studies. For her interdisciplinary MFA thesis, Katherine is studying artistic responses to landscape. dissevered from the greater picture. her constitution extending as far as it will go. and to the impossible tenderness of straying limbs. bundled tightly into a spiralling coil of energy. tangled with the threads of an exquisite dream. With our Issue 21 launch just around the corner we’re going to be doing things a little differently. We’re done with our Issue 20 snippets, so if you want to read more from our Rebirth Issue you’re going to have to pick up a hard copy (oh no, a beautifully bound magazine with colour images and bursting with creative works that’s easy to carry around and read at any time, what a hardship!). Instead of our regular Snippets, Editor Features, and Interviews, we will only be posting Teasers for the upcoming Issue (we know, this change is difficult to adjust to, that’s why we’re giving you three Teasers a week instead of our usual two posts). These Teasers didn’t quite make it into Issue 21, but we couldn’t not share them with you! Hello! Are you excited for Issue 21? We are, and we’d love if you can join us! It’s happening April 27 (in 24 days!) at Shelf Life Books. It’s a Thursday and it’s after final exams at the UofC, so you have no excuse not to join us. We start at 7pm and have some lovely readers and a musician lined up to celebrate this launch! Good Morning! Monday’s snippet was late enough to enjoy at the end of your day, so today’s Editor Feature is early enough to enjoy before work or school (and if you’re already at work or school you can take a break–you deserve it). Allison Iriye is a contributing editor for our team and studies crime and monkeys (not crime committed by monkeys). Take a read of her poem (it’s short and sweet)! is the Devil, not god. to Hell when we die. the heaven we were promised.